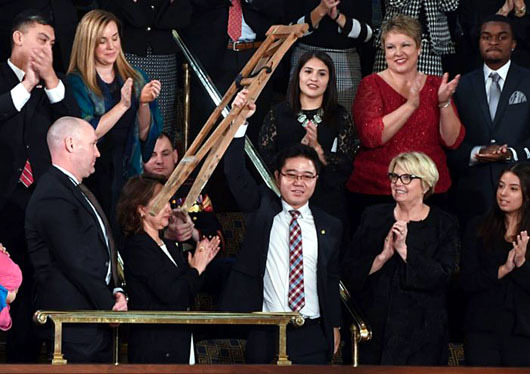 An emotional North Korean defector, who walked thousands of miles on crutches through Southeast Asia to escape his homeland, kept the crutches to remember his ordeal and waved them aloft as President Donald Trump hailed him during the State of the Union address on Jan. 30. Ji, who lost a leg in the process, now has a new prosthetic leg, but he uses the crutches as a symbol of how far he’s come, Trump added. Ji now lives in Seoul, South Korea and has dedicated himself to helping other North Korean defectors. He studies law at Dongguk University and serves as the president of Now Action and Unity for Human Rights, a position that allows him to broadcast into North Korea “what the regime fears the most – the truth,” Trump said.